Manny Pacquiao’s ascent through the weight divisions is nothing short of amazing, and throughout his reign, he’s sharpened his tools and added a few new ones along the way. He has turned from a whirlwind slugger to more of a boxer puncher. In his prime, he was super quick, hard-hitting and even harder to predict. If you want to learn advanced boxing techniques, I highly recommend the Advanced Boxing Workshop, which shows you how you can improve your balance, footwork and punching power. Here are the top 5 Manny Pacquiao boxing techniques. Another quality of boxing technique that Pacquiao has is good head movement, which he sometimes uses as feints to disguise when he’s going to throw a punch. If he leans to his right side, he may throw his straight left. Most of the time, Pacquiao is the aggressor in a fight and he bobs his head from side-to-side in order to get into range without being caught cleanly with incoming punches. One of Pacquiao’s most underrated boxing techniques is his use of feints, which is often overshadowed by his other qualities. His feints are subtle and unpredictable which makes his opponents fall for them often, leaving them off balance as they end up committing to their own move first. The most common of Pacquiao’s feints is when he takes a quick step forward with his front foot, and acts as though he’s about to leap into range to throw the one-two straight down the middle, and sometimes he will immediately after using this feint. The straight left punch is undoubtedly Pacquiao’s trademark punch. He made his reputation of knocking down fighters with that punch. It’s quick, accurate and powerful, and when combined with the aforementioned feint, it adds the surprise factor in as well. 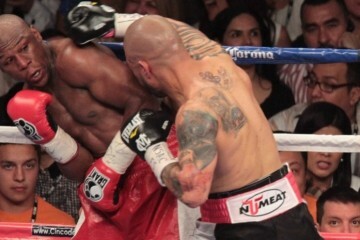 Timing his orthodox opponent’s jab, and throwing the straight left at the same time, as seen in the Miguel Cotto fight. Sneaking the straight left in the middle by slightly leaping off his back foot, such as in the Oscar De La Hoya fight. 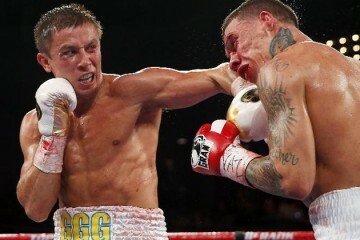 The power straight left, usually set up by a single or double jab. This has knocked many of his opponent’s down. For a long time, during his time in the lower weight divisions, Pacquiao relied on his straight left which was often enough to get his opponent’s respect. But when he ascended into the lightweight division and above, there was significant improvements in Pacquiao’s right hook. Ever since Pacquiao began his move to the lightweight division, him and his famed trainer, Freddie Roach, has been working meticulously on the right hook. 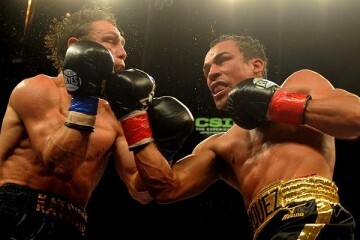 Results of his improvement were seen particularly in his fights against David Diaz, Ricky Hatton and Miguel Cotto. Pacquiao is able to throw his right hook, short or wide, and then pivot his lead foot anti-clockwise and roll under his opponent’s oncoming left hook. Pacquiao’s ability to throw shots from a variety of angles with blazing speed makes it difficult for his opponents to see the punches coming. 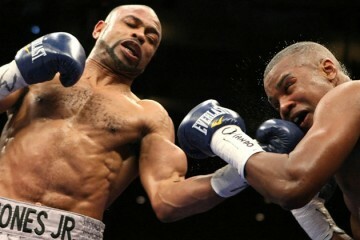 This is mainly due to his footwork and confidence to throw these unorthodox punches from awkward angles. Pacquiao utilizes his quick feet to adopt an in-and-out style and constant pivoting, it’s hard to predict where he’s going to be. One moment he’s there throwing punches, and by the time his opponent is set to return fire, he’s in a completely different position.